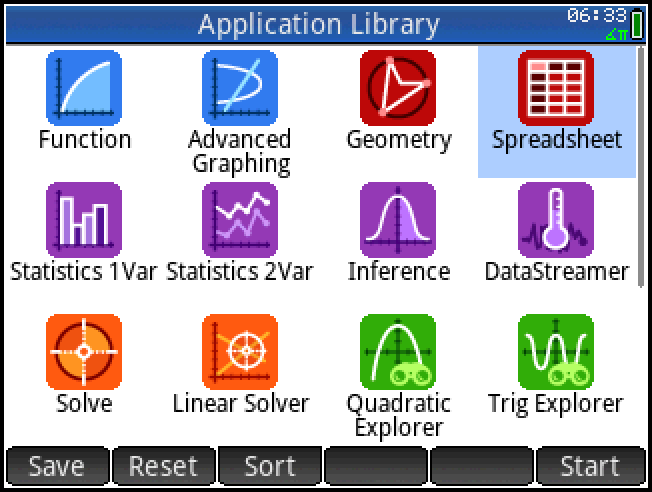 Over the next couple of weeks, I will be posting short tutorials on how to use the HP Prime Spreadsheet. Let’s get started. First, some preliminaries. [ button ] : keyboard buttons. Press the [Apps] key. 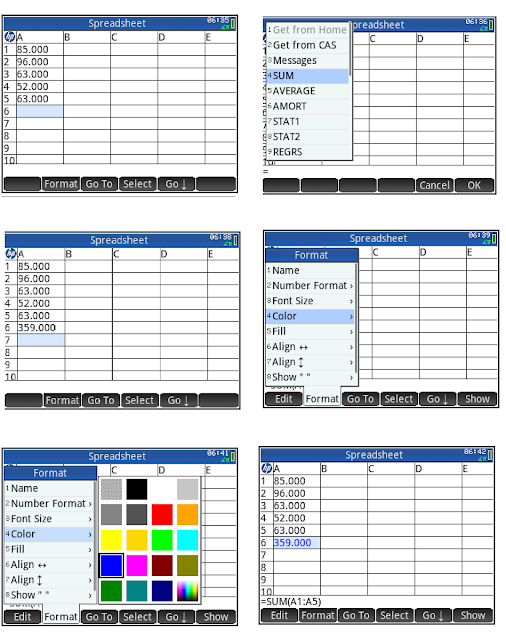 Spreadsheet is one of the default applications to choose from when the HP Prime is first purchased. 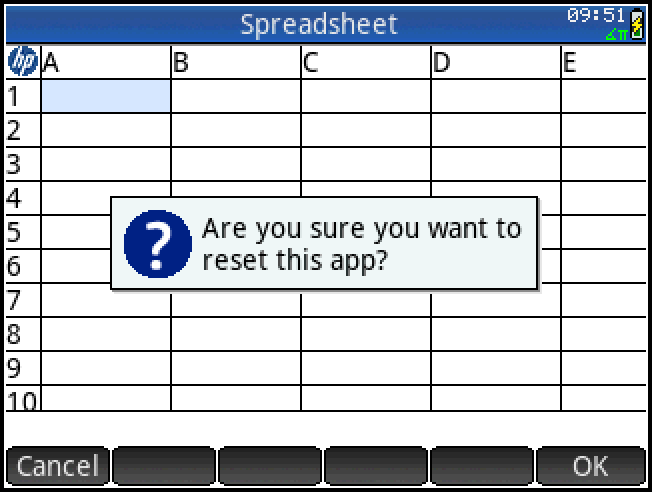 To enter the spreadsheet, all you have to do is tap the Spreadsheet icon on the Apps screen. 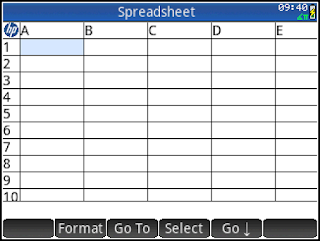 You can clear the spreadsheet and all of its formatting, press [Shift], [ Esc ] (Clear). 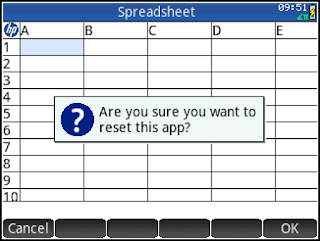 Tap ( OK ) to clear the spreadsheet. 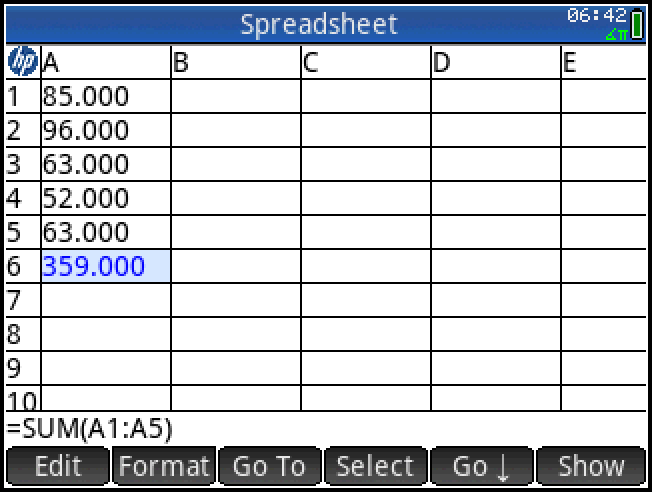 You can access the spreadsheet at any time (while you are in the app) by pressing the [ Num ] key. Use the spreadsheet to add the following numbers: 85, 96, 63, 52, and 63. Colorize the sum to differentiate it from the rest of the numbers. 1. Enter the following numbers into cells A1 through A5 respectively: 85, 96, 63, 52, and 63. 2. You should be at cell A6. If you are not you can either (a) press the arrow keys to get there, (b) tap the cell A6, or (c) press the (Go To) soft key and enter A6 as the Target. Remember to use the [ ALPHA ] key for the A. 3. At cell A6, press [ Shift ], [ . ] ( = ) for the equals sign. 4. Press the [ Menu ] key, select 4 for SUM. Next, press the parenthesis key [ ( ) ]. 5. Enter A1:A5. You will need to type the range. You should have =SUM(A1:A5) showing on the command line. 6. Press the soft key ( OK ). You should get the sum of 359. 7. To color the sum, select the cell A6 again. 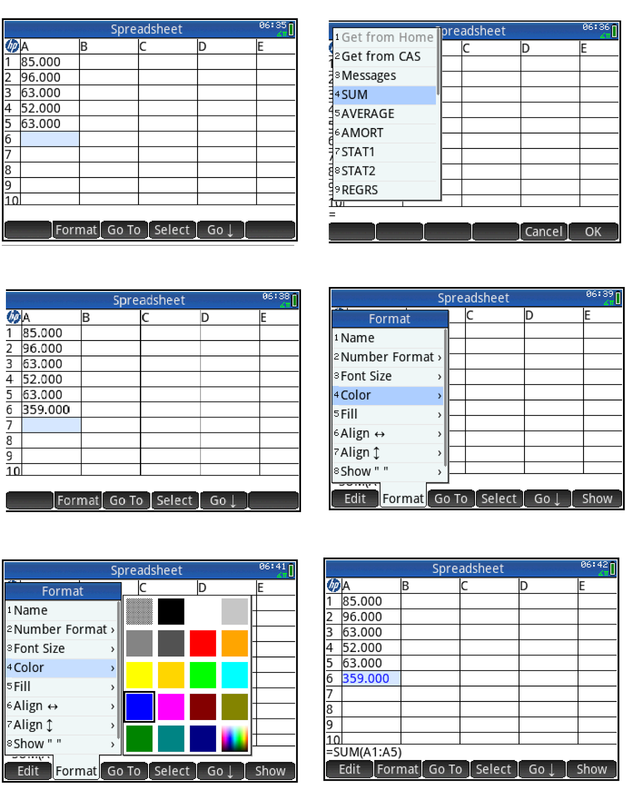 Press the (Format) soft key, select 4 for Color, and select any color you want. In the illustration below, I selected blue (my favorite color). Thanks again for your tutorials. Very helpful! 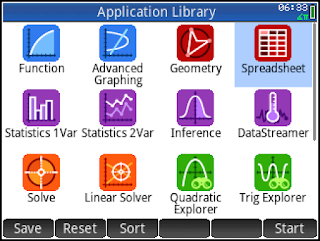 Hi Eddie, If I am in RPN mode I keep getting "Syntax Error" when entering formulae in the Spreadsheet App. If I change to Textbook mode all is well. Any idea why that is the case? Eddie and Mike, thank you, your information is very helpful. Hello, how do I get the : sign? Press the Shift key, followed by the "Vars" key for "Chars." You'll then see the character you want in the second line from the top, beside the 9. How do you insert a row in front of this one to add the label: "Total" in front of the some? Also can you select the cells without typing the names? 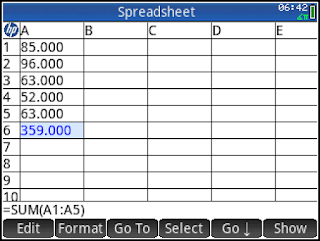 And is it possible to pick up the forumula =SUM() from a list of common Spread Sheet functions? Also forgot to ask how do you save the sheet for later use? How do you save a document. It seems to just be creating more apps. Plus what is the basic starting point for a calculation work space where nothing is saved? Any edits to the Spreadsheet app is automatically saved. 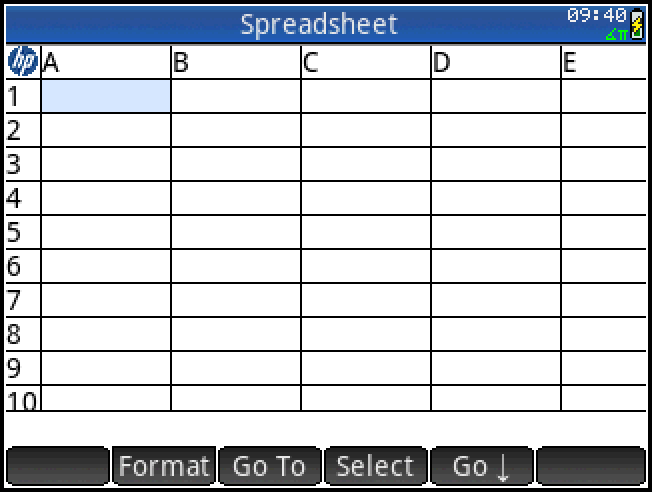 I am not aware of any method to save the spreadsheet in a separate file.